As we know, the Arctic is supposed to be one of the fastest warming regions on the planet. According to GISS, above, most of it is between 2 and 4C warmer than it was in 1979. Annual anomalies appear to have steadily increased since 1979 at a rate of 0.54C/decade. However, we also know that there are next to no temperature monitoring stations anywhere near the North Pole. To fill these gaps, GISS rely on temperature readings from land stations up to 1200km away. I am also unconvinced by NOAA’s gap filling in the Arctic, and in my opinion this introduces substantial error into their analysis. I addressed the issue of gap filling in the Arctic in this recent publication: Curry JA, 2014: Climate science: Uncertain temperature trends. Nature Geoscience, 7, 83-84. Gap filling in the Arctic is complicated by the presence of land, open water and temporally varying sea ice extent, because each surface type has a distinctly different amplitude and phasing of the annual cycle of surface temperature. Notably, the surface temperature of sea ice remains flat during the sea ice melt period roughly between June and September, whereas land surface warming peaks around July 1. Hence using land temperatures to infer ocean or sea ice temperatures can incur significant biases. Put simply, the presence of sea ice moderates air temperatures above it, thus reducing volatility. This effect can be seen on the DMI reanalysis of temperatures north of 80 degree. In summer months, temperatures rarely vary much from the mean (1958-2002), and stay only just above zero. This the chart for last year, but most preceding years show similar patterns. The situation on land is totally different. There, a puff of wind from the south or a bit of sunshine can dramatically increase temperatures. This effect is accentuated by low humidity in the Arctic, where a given increase in heat content will have a much larger effect than at lower latitudes. Given these facts, there is no justification at all for gap filling from land stations in the Arctic, and it can only lead to substantial errors, as Judith Curry notes. We find that the GISS trend of 0.54C per decade has been dramatically reduced to 0.23C. Unfortunately GISS do not publish monthly anomalies for the Arctic, so we cannot see whether the difference is a seasonal one. However, if we put the two trends together, we find that most of the divergence has occurred since 2004. In comparison with GISS, UAH shows little trend since 2001. I understand from the Karl press release that he is now working to “correct” Arctic temperatures for his next NCDC update. If he follows the GISS process, it will only lead to more spurious upward adjustments to the global temperature trend. It is surely time that the climate establishment accepted that they have absolutely no clue what temperatures are in the Arctic, and take these out altogether from their global calculations. This will, of course, reduce global warming trends, and may even result in cooling in the last decade or so. In any event, any warming in the Arctic means diddly squat in terms of heat content. Unfortunately, the “melting” Arctic is their poster child. Take that away, and they have little left. From what I recall the UAH and RSS satellite global temperature estimates do not have coverage at the poles either. No directly overhead cover, I think. Periapsis: 846 km. Apoapsis: 866 km. Period: 102 minutes. Inclination: 98.7° Eccentricity: 0. Dr. Hansen said the Arctic was real important, and therefore many new monitoring stations in and around the Arctic were set-up to carefully and accurately watch it. Many satellites were launched to fly over the Arctic area watching and recording the smallest change. After all we can’t have real scientists arguing the case for a warming world from ignorance of the facts could we? Damned fools and idiots! Not real science and not real scientists. They are nothing but alarmists puppets, and they are costing everyone thousands (of $, £, €, or ¥) per year of our hard earned cash. I’ve hoped that the Arctic ice would all disappear but unfortunately if that happens everything just south of there will (based on studies of the past) be more than likely to freeze with the beginning of a new ice age. Also many, many other papers by Igor v. Polyakov, John E. Walsh, and Ronald Wok (http://journals.ametsoc.org/doi/abs/10.1175/bams-d-11-00070.1) , and J.E. Walsh, (http://journals.ametsoc.org/doi/abs/10.1175/1520-0485(1979)009%3C0580:AAOASI%3E2.0.CO;2) others like Leonid Polyak et al. (http://www.sciencedirect.com/science/article/pii/S0277379110000429 ) show it is not unusual for the Arctic ice area,extent, or volume to vary wildly. We get snared in their traps! Whereas the presence of sea ice may cause a very low temperature variability in sea surface temperatures, it may also cause the high variability land surface temperatures in the area. For instance in Svarlbard there has been over 4 degrees of warming from 1976-2006, and over 5 degrees of warming from 1915-1930. Reykjavik, which is still influenced by sea ice extent, still shows a couple of degrees of warming in both periods. Following on from the comment above, GISS has similar massive warming at 64N-90N (basically the Arctic covering 5% of the globe) for both the early twentieth century and the recent period. They also have temperature anomalies for 64S-90S (basically Antarctica) right back until 1880. Until 1930 there was massive cooling in Antarctica, nicely offsetting the massive warming at 64N-90N. Yet on mainland Antarctica there were no permanent bases until the 1950s. Until that time the measurements were highly variable compared with the rest of the world. Despite this huge variability, for the period 1903-1955 the Antarctica temperature anomaly closely parallels that of Base Orcadas located at 60.8 S, 44.7 W.
It is one of the most important axioms of climate science that the rate of increase of temperature in any given location is inversely proportional to the density of the temperature measuring stations at that location. The smaller the number of stations per square mile, the faster the rate of increase in temperature. Very witty, (as you often are in your comments) but I think the opposite of what might be actually happening. If you look at the raw data for many long-term data sets you will find that there was similar warming the early twentieth century as from 1976-2006. But post-homogenisation, the earlier warming was shown as considerably less than the earlier warming. There are three elements that I believe cause this. First is that homogenisation is usually based on pairwise comparisons with surrounding temperature stations (GHCN/GISS) or by comparison with some composite average for the area (BEST). 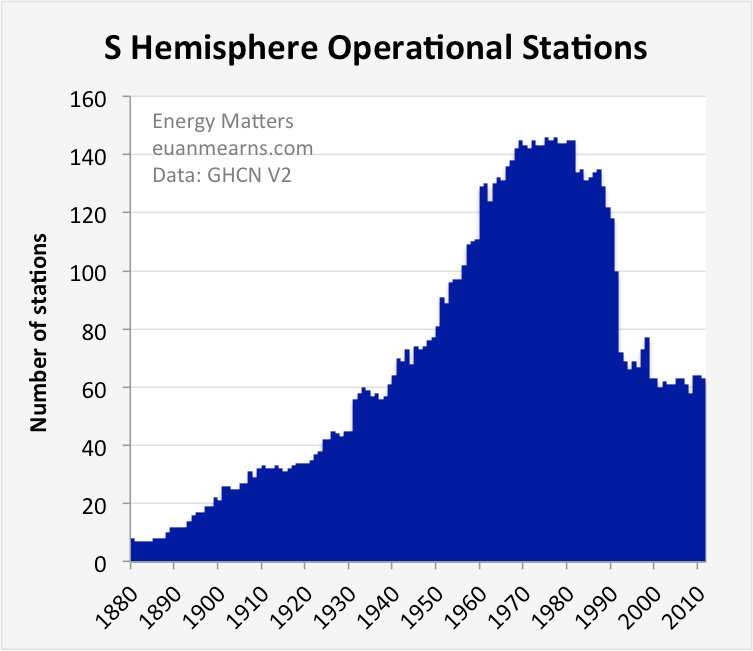 Third, if you also look at the number of temperature stations over time Euan Mearns has been posting about, you will notice that pre-WW2 there is a sharp drop off (See Southern Hemisphere below from http://euanmearns.com/the-hunt-for-global-warming-southern-hemisphere-summary/) before 1950. The earlier warming in based on much less data than later warming. Bring these three elements together, and over time you will realize that homogenisation is not on the same basis. For 1910s-1920s you will either have to homogenise on much less data and/or over much larger areas than the 1960s-1980s. As a consequence, the net differences will be greater. Less data means greater suppression of local variations and also likely of global regional trends. It might be that homogenisation actually suppresses naturally variation in the distant past, making recent spike of 0.6C seem trivial. It is a conjecture that is potentially testable.